523. Latest on British Isles Show with Coronation Street’s Alya Nazir Sair Khan – 2015. 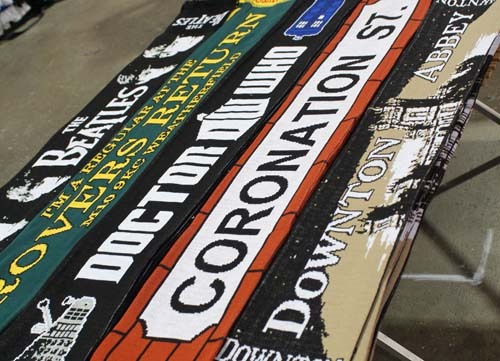 British scarves at British Isles Show 2013. Ruth writes: Just talked with Brian Martin of the British Isles Show who said that one section of the Zoomer Show will be devoted to the British Isles Show under a 12 X 12 Coronation Banner. Appearing in person will be Sair Khan who plays Alya Nazir in ITV’s Coronation Street. Martin estimated that about 45 to 50 British vendors will be there at Hall A, Enercare Centre, 100 Princes’ Blvd. October 31-November 1, 2015. For more information, see: https://www.facebook.com/zoomershow/photos/a.10150318989437503.339118.347998647502/10153183611167503/?type=3&theater or email brian_martin@rogers.com or phone his cell at 416-948-9245. Brian Martin only mentioned Andrea Beckett of Coronation Street. You might check with him yourself: brian_martin@rogers.com or phone his cell at 416-948-9245. Ruth. Thanks for the update Tammy. Norman writes: I was googling any possibility of seeing another British Isles show here in Toronto this year. I missed last year for some strange reason and I don,t like it when it is connected to the Zoomer show. It seems to lose its British flavour for some reason. I’d prefer it to be run on its own. Its much better. I was wondering if it will be held this year. The last time it was at the International centre in Missassauga. It was good. I bought alot of products and enjoyed the entertainment and the Beatles tribute. Let me know if and when the British show will be in town. All these other shows from other countries seemed to get more exposure than the British does. I always have this funny feeling that Toronto doesn’t want to be in any way connected to everything British. That’s my take. Ruth writes: Brian Martin who runs the British Isles show has been promising to tell us about this year’s version. We are still waiting to hear from him and will let you know when we do. Any more updates about a 2016 British Isle Show? The Zoomer show is doing it again with the British Isle show like last year, but it really didn’t have much of a British show. They had a guest (Alya) from Coronation Street, but she was just signing autographs, there was no question & answer show with her. I really miss the British Isle shows they used to have at the Queen Elizabeth building at the EX, and then the following years at the Mississauga Centre. I don’t understand why they stopped doing that….it was always packed! I keep contacting Brian Martin but so far – he just keeps telling me he will let me know what’s going to happen. I will pass on the information as soon as he does. Sorry, I can’t be more helpful than that. Ruth. HALL A ( west side of building ), Enercare Centre – Hall A, 100 Princes’ Blvd., Exhibition Grounds. Keep tuned to TorontoMulticulturalCalendar.com for more information.